It's Christmas in July at Crafter's Companion and today we start sneak peeks for an adorable new collection called Nordic Christmas. My fun Pocket Card features images and pattern papers from the CD-ROM that is part of this collection. The sentiment is from one of the stamp sets called Christmas Cheer. For the card, I used Shimmer Pocket Card & Shimmer Tag both in Forrest Green & then printed and attached the pattern paper from the Nordic Christmas CD-ROM. Stay tuned next week for this fun new release! Hi Friends! I hope you are having an amazing start to your Monday! Today I thought I would share this fun Cracker Box with you that I made using my Big Score Board from Crafter's Companion. Here is the template that I used and how I made the box. Step 1: Select a piece of 12x17 pattern paper/cardstock. Step 2: Line up the 12" side along the left edge of The Big Score, and score at 1", 2" and 3". Step 3: Flip the cardstock around to the other short side and score again at 1", 2" and 3". Step 4: Line up the 17" side along the left edge of The Big Score and score at 1" and then every 2" along the entire sheet. Step 5: Fold and burnish all of the score marks. Step 6: With scissors, fold the cardstock and cut diamonds as shown above. Step 7: Add strong adhesive on top long edge and attach to the other long edge to form the box. Step 8: Add ribbon to close the ends & decorate. 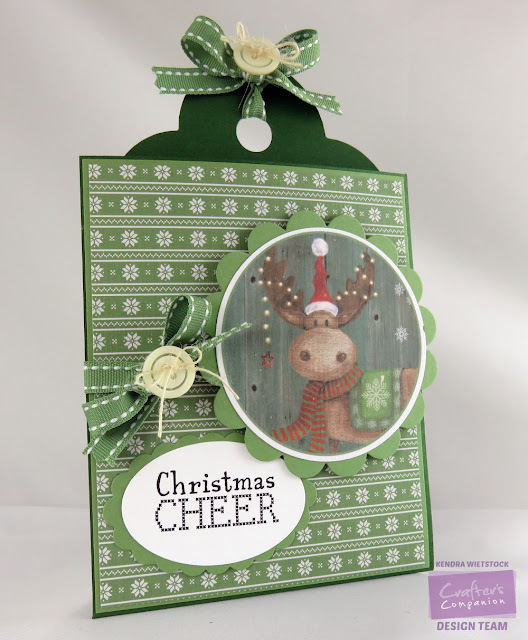 Today I have yet another card to share using some fab dies by Taylored Expressions. I had some extra background paper leftover from my card on Tuesday, so I used if for the flowers here and the sentiment. Super clean and simple card today ~ but that's what I was going for! Once again, I pulled out my Taylored Expressions supplies and my Spectrum Aqua Watercolor Markers and had some fun. I think what I like about this card is it's unexpected! The colors work together, but you wouldn't really reach for them. This weekend I found some time to create some cards and since my Taylored Expressions supplies were a bit loney, I pulled out this fun Silhouette Stems 1 die and the Greetings for Her sentiment set. I also pulled out some watercolor paper and my Spectrum Aqua markers to make the background patterns on the circles. Today I'm doing a tutorial using my Spectrum Aqua Markers with acrylic blocks... it's all about getting more out of your supplies and mixing things up a bit! For my cards today, I used one of my favorite Gina K stamp sets called Elegant Florals 2 by Theresa Momber. Step 1: Gather supplies - stamps, watercolor paper, large acrylic block, white pigment ink, white embossing powder, spray bottle and Spectrum Aqua markers (Aquamarine, Bud Green, Sunflower - Floral and Primary packs). Step 2: Stamp the image in white pigment ink on Spectrum Noir watercolor paper and heat set with white embossing powder. Step 3: Using the Aquamarine Spectrum Aqua Marker (Primary Pack), add color to the top of quarter of the acrylic block then spray with several squirts from the water bottle. Tip the block so the color runs a bit. Step 4: Turn the block over and "stamp" on the watercolor paper. Make sure to press all of the areas of the block so the color will transfer. Step 5: Use a watercolor brush to spread any color that didn't transfer until you get the look you want. The embossed flower will peek through. Step 6: Add Sunflower Spectrum Aqua Marker to the acrylic block and repeat step 5. Step 7: Add Bud Green Spectrum Aqua to the acrylic block and repeat. This time I turned the watercolor paper around so I would have a nice clean edge on the bottom. Step 8: Using a watercolor brush, blend and fill in the colors until you have the look you like. Here's a second card I made using the same basic technique with just a few changes. Step 1: Select Spectrum Aqua colors (Sunflower, Gold, Orange, Sunset) and using the brush tip, color each directly on acrylic block. Step 2: Spray several times with water bottle, flip over and press on to Watercolor paper. Make sure all of the areas are pressed down. Step 3: Using a watercolor brush, blend colors until you have the desired look. Set aside to dry or use a heat tool to speed things up a bit & then stamp images and sentiment. Here are the finished pieces ready to put on cards. Thanks for stopping by today! Stay tuned for more fun Gina K/Spectrum Noir tutorials in the coming weeks. How about a quick CAS card today? 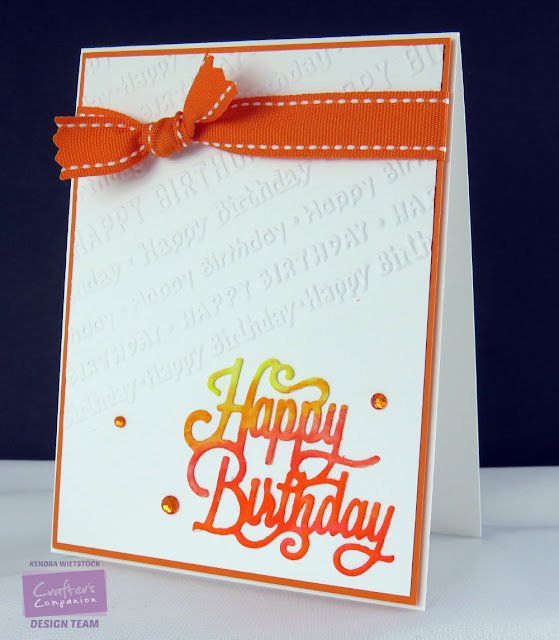 I love making Clean and Simple cards and these supplies from Crafter's Companion made for a very quick card. I used the Die'sire Only Words - Happy Birthday die and trimmed it from Spectrum Noir Watercolor Paper. Then I added some Spectrum Aqua colors (Gold, Sunflower, Orange and Amber) and blended the with a watercolor brush. Easy Peasy. The embossed Happy Birthday is from the Embossalicious Happy Birthday folder. I put my cardstock in at an angle and then added the HB die cut and some gems to finish it off. Had to get one more card made using the new Die'sire Fancy Edge'Able dies from Crafter's Companion. This time I made a pocket card using the Victoriana Die. I also added the Only Words - Special Friend die for the sentiment. Here is the full view of the pocket insert. Today is release day for some gorgeous new Die'sire dies from Crafter's Companion. They are called Edge'ables Fancy Borders and the die I am using today is the Floral Dance Die. It adds so much to this very simple card. Take a peek on the Crafter's Companion website later today to see the other 4 dies available in this collection! You'll love them! Crafter's Companion on HSN... TODAY!